Chris Nihmey is many things to many people – a son, boyfriend, friend, teacher and author. He also has a mental illness, and he refuses to let himself be defined by it. “I have an illness. 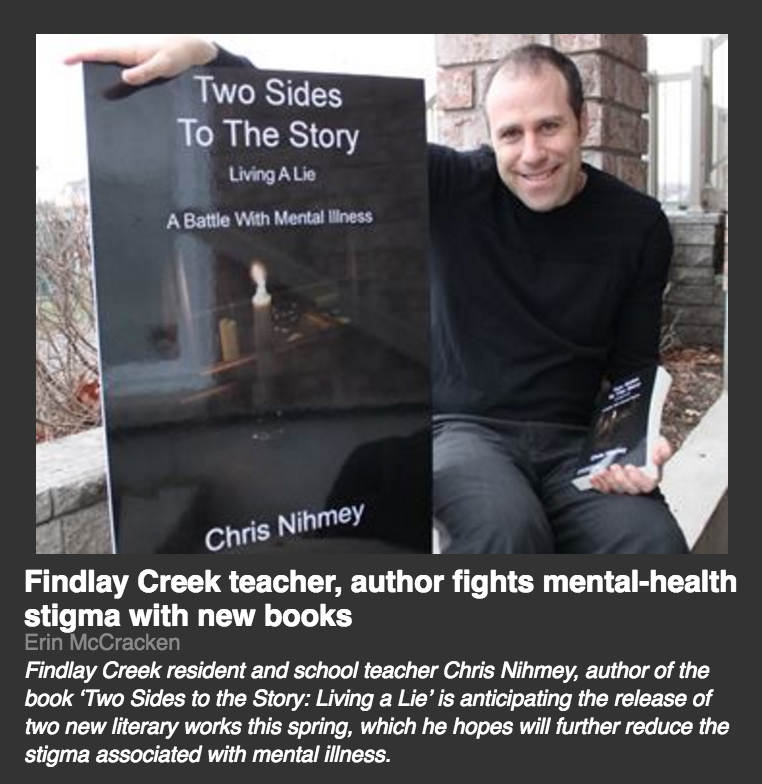 I’m not the illness,” the high school substitute teacher and Findlay Creek resident said. “When you link the person with the illness, you label them right away. Though Nihmey’s story has a happy ending, one that continues to unfold through much hard work, therapy, medication, a strong support network, exercise, dedication to volunteer work and personal and professional growth, for years he waged a very personal war in his effort to heal. His journey is chronicled on the pages of Two Sides to the Story: Living a Lie, a 400-page memoir published in 2013 about his fight through very dark times after becoming diagnosed at age 26 in 2001 with bipolar disorder and in 2003 with generalized anxiety disorder and obsessive compulsive disorder. Thirteen years later, Nihmey is now sharing his struggles and successes through multimedia presentations geared to intermediate and high school students, which he began doing in early 2014. The goal is to get youth talking about a subject that he said still carries enormous stigma. He is also anticipating the release of two new books this spring by Chipmunka Publishing, which specializes in mental-health publications. United Together: Reflections of Our Lives is an anthology of poems, short stories and autobiographies of 17 patients living at Royal Ottawa Place, a long-term care residence for adults with serious, complex and stable mental illness. Nihmey has volunteered there for many years. “What these people have done is truly amazing,” he said of those he’s coached through the writing process. Sally, which he is working on with a Florida-based illustrator, is his third children’s book, and will explore mental illness and stigma. “I wanted it to be for kids,” he said of the story, which he first published at the end of his 2013 book. Though his road to recovery has been arduous, today Nihmey is flourishing. He has a girlfriend, has his own home, continues to write, teach, give reading and writing workshops to elementary school students, make presentations to high school students, and he remains dedicated to his physical and mental well-being. He checks in with his psychiatrist about once a month and takes three different medications – 10 pills a day. Looking back, Nihmey believes he went through his own private hell for a very public reason. “Now I want to make a difference,” he said. A successful, well-liked teacher, Nihmey was, in the late 1990s, carefully hiding his problems from everyone around him, with the exception of his parents. “Even then, I was having ups and downs and on the down times I used to drive to work and actually pull the steering wheel quickly to the right hoping I would catch something and crash. That’s how bad it was,” he said. At school, he would lie on the floor of the locked bathroom during lunch to escape his thoughts. The bell would ring and he would go back into the hallway and greet the kids. “Basically, I lived a life in front of people with a smile and pretend that everything was OK, and meanwhile the other side of my life was behind closed doors and it was awful,” he said. Though diagnosed with bipolar in 2001 and prescribed medication, Nihmey refused to take the pills for another two years – until things became worse. After he began taking his medicine, it took time for it to work. Very dark times lay ahead. During one of the most difficult periods of his life, he lived in the dark in his parents’ basement for two months. He would try to expel his anxiety by punching his apartment door. “I had bruised knuckles for years from punching the doors and walls,” he said. His obsessions overshadowed his life. He obsessively stopped to pick up garbage on the street, filling his trunk with discarded mufflers and tires. “I used to take 40, 50, 60 minutes to get places that were like 15 minutes away,” Nihmey said. Change came in 2006, the year he began writing his non-fiction work. A concerned neighbour, who heard Nihmey through the apartment walls yelling and cursing at his father over the phone, threatening to take his own life, called police. “All three disorders were just knocking me down,” Nihmey said. Nihmey, clad only in his underwear, opened it to find two uniformed police officers and paramedics with a stretcher. As he let them into his apartment, he felt small and ashamed, and convinced himself they were there to take him away in handcuffs in front of his neighbours. “If that had happened, I knew my healing would have fallen way back because it would have just destroyed me to do that,” he said of the stigma he feared. Instead, the officers telephoned Nihmey’s dad, asking him to come over. One officer went to Nihmey’s bedroom and grabbed a T-shirt for him to wear. Those small acts made a world of difference to Nihmey, who has since been invited to speak to police on several occasions during mental-health training sessions regularly hosted by the Ottawa Police Service. By sharing his story with law enforcement, Nihmey hoped to educate officers attending the classes about the importance of not labelling people experiencing mental-health issues or crises, and seeing the person rather than just the illness. That same year, Nihmey realized it was up to him to either take the reins of his sickness or continue leading a “mediocre” life. “You have to want to heal. You have to want to get better,” he said, adding that having a strong support network and the right medical help have also been critical ingredients in his road to success and happiness. To arrange a presentation or for information on ordering Nihmey’s books, visit chrisnihmey.com. ← Readers And Writers, Listen Up!